Deck, Patio, or Both? Which Makes the Most Sense for Me? Although the weather in Northern Virginia is cold and you may not be thinking about spending a lot of time outdoors anytime soon, it is never too early to plan your deck construction or patio construction project for the spring. Many people use the terms deck and patio interchangeably, but each is a different type of outdoor surface that may have certain benefits for your yard. Decks and patios have some structural differences that you should understand before beginning your project. Patios typically do not have walls or railings and usually are not elevated off the ground. Patios are often made of paved materials like concrete, stone, bricks, or similar materials. Decks are usually made of wood or composite materials and are elevated off the ground, often attached to the upper stories of a house. 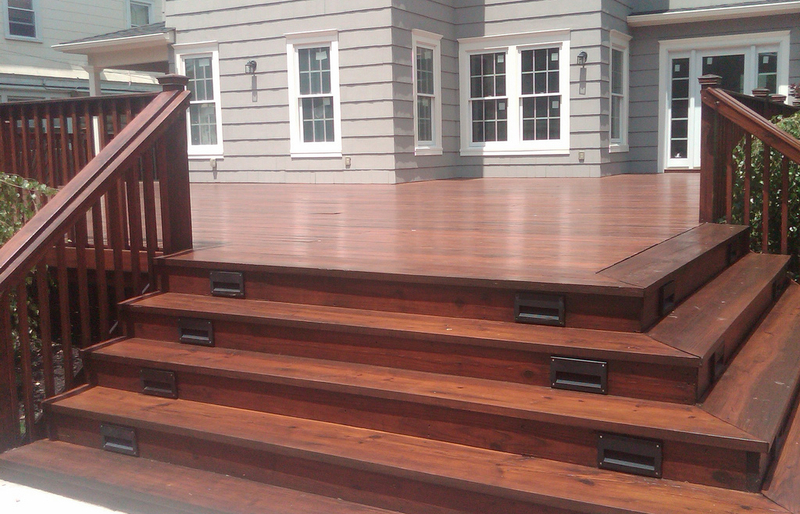 Because they are elevated, decks usually contain railings and stairs. Decks are often large in size and are built to wrap around the house. Because decks are often bigger than patios, they are perfect if you like to host summertime gatherings like barbecues and pool parties with friends and neighbors. Decks also allow you to make the most out of your backyard view. Since decks are usually bigger than patios and require extra material like railings, they can be the pricier option, depending on your individual project’s requirements. Patios are very versatile, with the potential to be designed in a variety of shapes and layouts. They are often designed to complement landscaping. Patios can be a variety of sizes, but many are smaller and serve as places for a little extra outdoor seating, as opposed to a space to host a gathering. Because patios are usually not elevated, they can be safer for pets and small children. Patio construction can also cost less than deck construction, but the price will depend on the scope of your project. Homeowners looking for a new landscaping or home renovation project may consider building both a deck and a patio. Overall, building both will give you more outdoor entertaining space. You could use your deck to host most partygoers and do the cooking during a barbecue, and have the patio as an option for more quiet seating. Some homeowners have a patio underneath their deck for shade. Before beginning your project, you should check with your contractor to see if your home is suited to have both. Overall, whether you decide to choose deck construction, patio construction, or both depends on your personal tastes and budget. No matter your project, trust Groff Landscape Design to deliver you a beautiful end result. We offer luxury landscaping at affordable prices. We are dedicated to giving you a yard—and home—that you will love and exceeding your expectations at every step of the way. Start your deck construction or patio construction project and contact Groff Landscape Design today!